Once a month, downtown Edmond hosts a pop-up community celebration called Heard on Hurd. Walk through the downtown district as local musicians play on the streets. All can also enjoy some of the metro’s best food trucks, which come out to serve their tasty creations. Small businesses stay open late for shopping during this local festival. 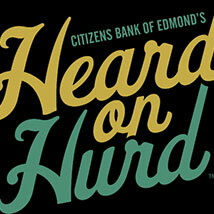 Come experience the best of Edmond each month at Heard on Hurd.